Seth Taylor is the new executive director of the NoHo Business Improvement District. NOHO — The NoHo NY Business Improvement District has a new director for the first time in its 18-year history. After just two weeks on the job, Seth Taylor, 35, is coming up with new ways to grow the BID built by founding director Harriet Fields, who retired earlier this summer. "She did a terrific job of starting the organization, and building it into a really solid BID," Taylor said, highlighting her work nurturing the neighborhood's art and cultural cachet. "We want to build on that, but we're looking to involve more people from the community." 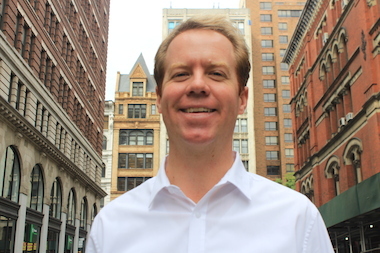 Taylor has a decade of experience working on BIDs all over the city, including a year as the director of Economic Development for the Union Square Partnership, where he spearheaded a program to help small businesses make energy-efficient upgrades. He then headed to Queens to helm the 82nd Street Partnership in Jackson Heights. Since taking over the Downtown area bounded by Houston Street and Astor Place, and spanning from Mercer Street to Lafayette Street, Taylor has been thinking strategically about how to grow the BID. Every business and resident pays dues to the district, and one of Taylor's primary goals is to get more of the members involved. During a stroll down Lafayette Street, Taylor delightedly noted the new, hard-fought bike lane the Department of Transporation just funded this year, contemplated horticulural projects for the medians separating the bikes from the street, and paused to marvel at some of the distinctly NoHo buildings and sidestreets. "I'm just intrigued by these alleyways," Taylor said, pausing at a cobblestoned alley off Lafayette Street. "I have to find out if these are public or private." Taylor sees part of his job as making sure the district gets all of the public resources it can from the city, and also to activate some of the BID's most powerful private stakeholders — namely New York University. Taylor said NYU owns seven properties in the district. "We're looking to work closely with them, to leverage them as a resource to help with our programs," Taylor said. He shied away from stating any specifics yet, but said he hoped to involve some of the school's bright young minds from the urban planning graduate program, the business school, or the arts college, in coming up with creative projects as well. Taylor's appreciation for the architecture of NoHo serves as a good example for the challenge he sees ahead of him. This includes how to encourage economic growth — like the Annabelle Seldorf building and other "starchitect" projects along Bond Street he pointed to proudly — without losing the character of the neighborhood. He sees the old structures — like the century-old Stanford White building at the corner of Houston Street and Bowery, and 65 Sullivan St., where the only Louis Sullivan building in New York City sits — as well as little cobblestoned side streets as just as valuable to the district as new developments. "I think that's one of the charming elements of NoHo," he said. "I think that's why you see all these film crews out here, because they don't have streetscapes like that anymore [in other neighborhoods]." Taylor dropped by the DUMBO Arts Festival last weekend and was intrigued by the similarities he noticed between the two districts, particularly the architecture and the workforce — namely, the creatives populating the loft-style offices in both neighborhoods. "In some ways, we can look to DUMBO as a model or inspiration for what we can do here," he said, "in terms of engaging residents and working with the city to promote the neighborhood's assets."